The dishwasher is a very common appliance used in restaurants, bars, and hotels. Due to the sheer amount of plates, dishes, and other crockery items that need to be cleaned regularly, many restaurants and hotels used dishwashers. Otherwise, the cleaning work alone would require these business concerns to hire additional employees. Instead of doing this, a simple dishwasher is a much better choice. Not only does it help you save a great deal of money, but washing the dishes is also much quicker. However, like any other appliance, dishwashers also need to be regularly maintained and serviced. Here are a few common problems that you might experience in commercial dishwashers. One of the most common problems in commercial dishwashers is when the dishes do not dry properly. Obviously, doing this by hand takes up a lot of time; you will need dry towels on hand and must assign an employee to take the dishes out and dry them one by one. Most dishwashers have a self-drying option that immediately dries the dishes once they are washed. If your dishwasher is not drying the dishes properly, it’s probably because the rinse aid isn’t being used properly. All dishwashers use a liquid based rinsing aid, so it’s important that you get the dispenser checked and make sure that the rinse aid is being released properly in the dishwasher. This is a much bigger problem and can be caused attributed to a variety of factors. The first thing that you should do is check if you have just installed a new disposal, and whether the drain plug was removed or not. If it still doesn’t drain properly, there might be an issue with the dishwasher. Call a company that offers commercial dishwasher repairs in Perth and get your dishwasher professionally checked to find the source of the problem. If you can notice spots or stains on the glassware, check the quality of the water first. Hard water commonly leaves spots on dishware. Otherwise, the issue lies within the dishwasher, and it will need to be properly inspected. Avoid tampering with the dishwasher on your own; always call a professional company to check your dishwasher in order to make sure that the internal components are working fine. This is a common problem and likely has to do with the electrical control unit. If the dishwasher doesn’t start, it’s probably because there’s an interruption in the electrical supply. Get the dishwasher’s ECU checked; it might be an issue with the wiring, or certain electrical components may not be working properly. 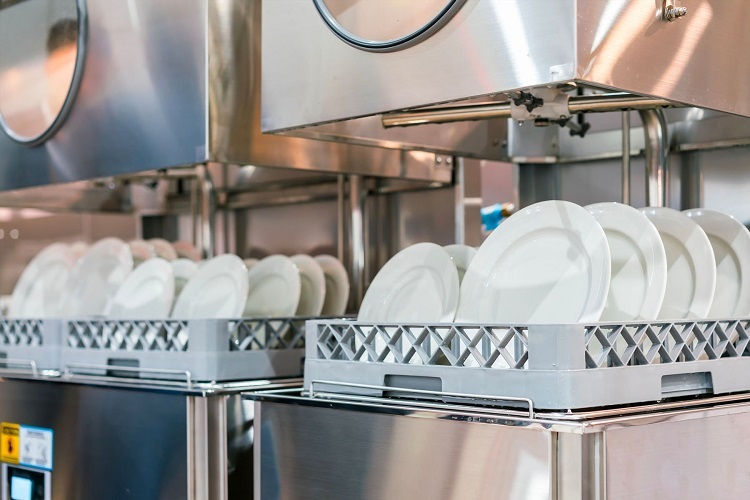 These are a few common issues that you might experience in a commercial dishwasher.